If you were watching the Tour de Suisse on Wednesday, you’ll have seen Jesus Herrada riding near the front of the peloton, indulging in a spot of face-pulling, as Movistar led home the pack in the final kilometres – preserving the leader’s jersey for Rui Costa on stage 5, 192.7km from Trimbach t0 Gansingen. At 21, Jesus is the baby of the team, which he joined last year after stellar results in the junior and espoir ranks. He’s a double national junior and U23 time-trial champion. Meanwhile, his brother Jose – five years older – who finished fourth in last year’s Route du Sud while riding for Caja Rural, competes in this year’s race in Movistar colours. Yes, the boys have realised a much cherished ambition to ride together on the same team. The Route du Sud is the last chance saloon for any of the French riders still hoping to secure their Tour de France berth. 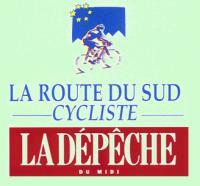 Now in its 36th edition, it takes place from Thursday 14th to Sunday 17th June in the spectacular French Pyrenees. Some will use this race as a warm-up for the Tour de France, although many top riders consider it to be too hard and too close to the Tour for preparation. The field is mostly made up of domestic and pro continental riders who come July, like you and me, will be watching the Tour de France on TV. A number of well-known riders have won this race early in their careers, including David Moncoutie, Thomas Voeckler, Sandy Casar, Michael Rogers, Levi Leipheimer, Jonathan Vaughters and Laurent Jalabert.